performed since: toured the Netherlands in april 2005; reprise by the US Army Orchestra & Jörgen van Rijen in the USA, 2007, and in the Netherlands and Russia by the NEON Ensemble (NL). "Frightening sounds [...] very special [...] all the elements for ghostly music and foreboding plucking of the strings. On top of that we get the wild sound of trombone master Jörgen van Rijen. The orchestra keeps growing in volume until the end, where it reaches an almost catastrophic climax. The sound this small orchestra can create is unbelievable. Praise for the composer, too, who is capable of writing contemporary music that stays accessible till the last measure." In Greek mythology, the harpy (“the ripping one”) is described as a powerful and immortal storm demon, which appears as a bird-like girl, and which treacherously seduces her victims before devouring them. In our world, she’s the largest bird of prey there is. She mainly lives on monkeys which she effortlessly plucks from the trees with her enormous claws. The piece starts with the creaking door of an ominous birdcage, where the harpy is sleeping. When she awakens - accompanied by the fearful voices of the other birds in the cage -, a deceptive dance of seduction begins. The solo trombone personifies the ancient voice of this mythical bird and the deterioration from sensuality to destruction. As she starts her song, a sensual pulse creeps gradually into the calm musical texture, and the orchestra is little by little dragged along in her spell. Horns and trumpets are harbingers of the smouldering tempest in their homophonic support of the spirally returning main theme. 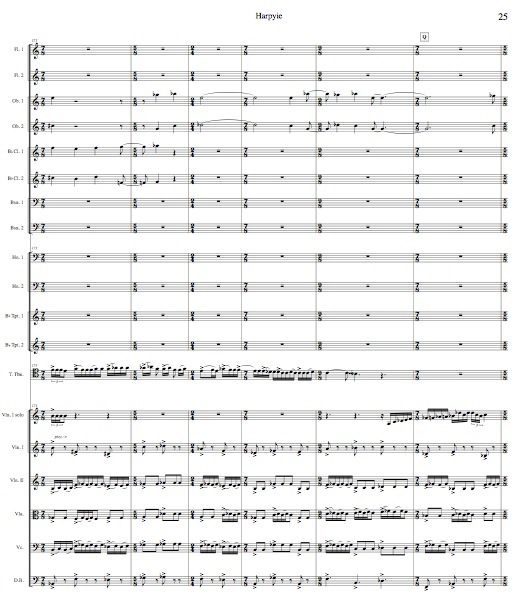 The calm breathing of the orchestra, symbolized by the heartbeat-like woodwinds, and accompanied by a percussive string orchestra, tilts to a wild musical choreography, wherein the string section leaders are challenged one by one in a capricious battle of virtuosity, while the orchestral accompaniment becomes more and more threatening. The question-and-answer play between these soloists is rhythmically inspired by flamenco footwork; the rest of the strings is used like a flamenco guitar by excessive pizzicato. The more her prey becomes hypnotized, the more the true face of the harpy begins to show - she conjures the all-consuming storm in the cadenza-like culmination, when the strings are released in all their might, and the tutti-orchestra reveals the monster in all its terrible splendour. The piece ends with the harpy’s kill.